Nano Tech Safety Guidelines and Hazards --- Pay Attention to the Comments there is more detailed explantion!!!! ICON Virtual Journal of Nanotechnology Environment, Health and Safety (VJ-NanoEHS) compiles papers in peer-reviewed journals that address EHS issues in nanotechnology. ISI - Web of Science Database contains peer reviewed journals, their references and citations. It also has very useful tools such as 'find related papers' that searches for papers sharing the same references as the entry you're looking at. This is the database behind the compilation of the journal citation factors. Knovel - Online Handbook Collection and Database is an extensive collection of handbooks and tables. PROLA - the Physical Review Online Archive searches Physical Review journals. Rubber Bible Online is a physical chemistry handbook which contains tables of physical and chemical data. Spin AIP Scitation searches related journals. Web of Science by ISI generates the impact factors (see journals below). Virtual Journal of Nanotechnlogy collects nanotech related papers from non-nano specialized journals. JBN is a peer-reviewed multidisciplinary journal providing broad coverage in all research areas focused on the applications of nanotechnology in medicine, drug delivery systems, infectious disease, biomedical sciences, biotechnology, and all other related fields of life sciences. JNN is a multidisciplinary peer-reviewed journal covering fundamental and applied research in all disciplines of science, engineering and medicine. JNN publishes all aspects of nanoscale science and technology dealing with materials synthesis, processing, nanofabrication, nanoprobes, spectroscopy, properties, biological systems, nanostructures, theory and computation, nanoelectronics, nano-optics, nano-mechanics, nanodevices, nanobiotechnology, nanomedicine, nanotoxicology. Is this peer reviewed or more a news/reviews journal? Open access journal with research articles, reviews and letters. multidisciplinary scientific serial: biological, physical, and social sciences. Thin-film synthesis, characterization, and applications. Impact factors are only guides to how much a papers is referenced in the years just after publication. Please add comments about the journals and update impact factors! Size is the general reason why nanoparticles have become a matter of discussion and concern.-The very small dimensions of nanoparticles increases the specific surface area in relation to mass, which again means that even small amounts of nanoparticles have a great surface area on which reactions could happen.--If a reaction with chemical or biological components of an organism leads to a toxic response, this response would be enhanced for nanoparticles. This enhancement of the inherent toxicity is seen as the main reason why smaller particles are generally more biologically active and toxic that larger particles of the same material .---Size can cause specific toxic response if for instance nanoparticles will bind to proteins and thereby change their form and activity, leading to inhibition or change in one or more specific reactions in the body [F4] . Besides the increased reactivity, the small size of the nanoparticles also means that they can easier be taken up by cells and that they are taken up and distributed faster in organism compared to their larger counterparts , .--Due to physical and chemical surface properties all nanoparticles are expected to absorb to larger molecules after uptake in an organism via a given route of uptake . Some nanoparticles such as fullerene derivates are developed specifically with the intention of pharmacological applications because of their ability of being taken up and distributed fast in the human body, even in areas which are normally hard to reach – such as the brain tissue . Fast uptake and distribution can also be interpreted as a warning about possible toxicity, however this need not always be the case . Some nanoparticles are developed with the intension of being toxic[F5] for instance with the purpose of killing bacteria or cancer cells , and in such cases toxicity can unintentionally lead to adverse effects on humans or the environment. Due to the lack of knowledge and lack of studies, the toxicity of nanoparticles is often discussed on the basis of ultra fine particles (UFPs), asbestos, and quartz, which due to their size could in theory fall under the definition of nanotechnology , .--An estimation of the toxicity of nanoparticles could also be made on the basis of the chemical composition, which is done for instance in the USA, where safety data sheets for the most nanomaterials report the properties and precautions related to the bulk material .--Within such an approach lies the assumption that it is either the chemical composition or the size that is determining for the toxicity. However, many scientific experts agree that that the toxicity of nanoparticles cannot and should not be predicted on the basis of the toxicity of the bulk material alone[F6] , . The increased surface area-to-mass ratio means that nanoparticles could potentially be more toxic per mass than larger particles (assuming that we are talking about bulk material and not suspensions), which means that the dose-response relationship will be different for nanoparticles compared to their larger counterparts for the same material. This aspect is especially problematic in connection with toxicological and ecotoxicological experiments, since conventional toxicology correlates effects with the given mass of a substance , . Inhalation studies on rodents have found that ultrafine particles of titanium dioxide causes larger lung damage in rodents compared to larger fine particles for the same amount of the substance. However, it turned out that ultra fine- and fine particles cause the same response, if the dose was estimated as surface area instead of as mass . This indicates that surface area might be a better parameter for estimating toxicity than concentration, when comparing different sizes of nanoparticles with the same chemical composition5. Besides surface area, the number of particles has been pointed out as a key parameter that should be used instead of concentration . Although comparison of ultrafine particles, fine particles, and even nanoparticles of the same substance in a laboratory setting might be relevant, it is questionable whether or not general analogies can be made between the toxicity of ultrafine particles from anthropogenic sources (such as cooking, combustion, wood-burning stoves, etc.) and nanoparticles, since the chemical composition and structure of ultrafine particles is very heterogeneous when compared to nanoparticles which will often consists of specific homogeneous particles . Finally, the structure of nanoparticles has been shown to have a profound influence on the toxicity of nanoparticles. In a study comparing the cytotoxicity of different kinds of carbon-based nanomaterials concluded that single walled carbon nanotubes was more toxic that multi walled carbon nanotubes which again was more toxic C60[F8] . In addition to the physical-chemical properties normally considered in relation to chemical substances, the physical-chemical properties of nanomaterials is dependent on a number of additional factors such as size, structure, shape, and surface area. Opinions on, which of these factors are important differ among scientists, and the identification of key properties is a key gap of our current knowledge , , . There is little doubt that the physical-chemical properties normally required when doing a hazard identification of chemical substances are not representative for nanomaterials, however there is at current no alternative methods. In the following key issues in regards to determining the destiny and distribution of nanoparticles in the environment will be discussed, however the focus will primarily be on fullerenes C60. Solubility in water is a key factor in the estimation of the environmental effects of a given substance since it is often via contact with water that effects-, or transformation, and distribution processes occur such as for instance bioaccumulation.---Solubility of a given substance can be estimated from its structure and reactive groups. For instance, Fullerenes consist of carbon atoms, which results in a very hydrophobic molecule, which cannot easily be dissolved in water. Fortner et al. have estimated the solubility of individual C60 in polar solvents such as water to be 10-9 mg/L. When C60 gets in contact with water, aggregates are formed in the size range between 5-500 nm with a greater solubility of up to 100 mg/L, which is 11 orders of magnitude greater than the estimated molecular solubility. This can, however, only be obtained by fast and long-term stirring in up to two months. Aggregates of C60 can be formed at pH between 3.75 and 10.25 and hence also by pH-values relevant to the environment . As mentioned the solubility is affected by the formation of C60 aggregates, which can lead to changes in toxicity . C60 will neither behave as molecules nor as colloids in aqueous systems, but rather as a mixture of the two , . Aggregates form reactive free radicals, which can cause harm to cell membranes, while free[F9] C60 kept from aggregation by coatings do not form free radical . Gharbi et al. point to the accessibility of double bonds in the C60 molecule as an important precondition for its interactions with other biological molecules.--- The solubility of C60 is less in salt water, and according to Zhu et al. only 22.5 mg/L can be dissolved in 35 ‰ sea water. Fortner et al. have found that aggregate precipitates from the solution in both salt water and groundwater with an ionic strength above 0.1 I, but aggregates would be stable in surface- and groundwater, which typically have an ionic strength below 0.5 I.--The solubility of C60 can be increased to about 13,000-100,000 mg/L by chemically modifying the C60–molecule with polar functional groups such as hydroxyl . The solubility can furthermore be increased by the use of sonication or the use of none-polar solvents. The chemical properties of individual C60 such as the log octanol-water partitioning coefficient (log Kow) and solubility are not appropriate in regard to estimating the behavior of aggregates of C60. Instead properties such as size and surface chemistry should be applied a key parameters 18.-Just as the number of nanomaterials and the number of nanoparticles differ greatly so does the solubility of the nanoparticles. For instance carbon nanotubes have been reported to completely insoluble in water . It should be underlined that which method is used to solute nanoparticles is vital when performing and interpreting environmental and toxicological tests. Information about evaporation of C60 from aqueous suspensions has so far not been reported in the literature and since the same goes for vapor pressure and Henry’s constant, evaporation cannot be estimated for the time being. Fullerenes are not considered to evaporate – neither from aqueous suspension or solvents – since the suspension of C60 using solvents still entails C60 after evaporation of the solvent , . According to Oberdorster et al. nanoparticles will have a tendency to sorb to sediments and soil particles and hence be immobile because of the great surface area when compared to mass. Size alone will furthermore have the effect that the transport of nanoparticles will be dominated by diffusion rather than van der Waal forces and London forces, which increases transport to surfaces, but it is not always that collision with surfaces will lead to sorption . For C60 and carbon nanotubes the chemical structure will furthermore result in great sorption to organic matter and hence little mobility since these substances consists of carbon. However, a study by Lecoanet et al. 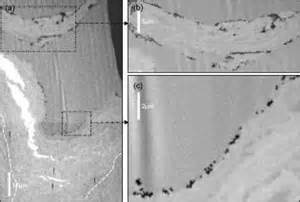 45 found that both C60 and carbon nanotubes are able to migrate [F10] through porous medium analogous to a sandy groundwater aquifer and that C60 in general is transported with lower velocity when compared to single walled carbon nanotubes, fullerol, and surface modified C60. The study further illustrates that modification of “on the way to - or after “- the outlet into the environment can profoundly influence mobility. Reactions with naturally occurring enzymes , electrolytes or humid acid can for instance bind to the surface and make thereby increase mobility , just as degradation by UV-light or microorganisms could potentially results in modified C60 with increased mobility 45. Most nanomaterials are likely to be inert , which could be due to the applications of nanomaterials and products, which is often manufactured with the purpose of being durable and hard-wearing. Investigations made so far have however showed that fullerene might be biological degradable whereas carbon nanotubes are consider biologically non-degradable , . According to the structure of fullerenes, which consists of carbon only, it is possible that microorganisms can use carbon as an energy source, such as it happens for instance with other carbonaceous substances.--Fullerenes have been found to inhibit the growth of commonly occurring soil- and water bacteria ,  , which indicates that toxicity can hinder degradability. It is, however, possible that biodegradation can be performed by microorganisms other than the tested microorganisms, or that the microorganism adapt after long-term exposure[F11] . Besides that can be degraded by UV-light and O . UV-radiation of C60 dissolved in hexane, lead to a partly or complete split-up of the fullerene structure depending on concentration . The study of nanoparticles and uncovering their potential to be incorporated in technology has evolved rapidly in the last two decades. Many of these nanoparticles are being added in merchandises such as wrinkle and stain resistant fabrics, sunscreen, glare-resistance eye glasses, medical uses and much more. Although this evolution of nanotechnology is vastly improving our current materials, the hazardous properties of these nanoparticles and their implication within workplace safety is long overdue and is now stated to be investigated. Concordia University Environmental Health & Safety (EHS) has developed this following document to provide guidelines concerning the work with nanoparticles within its laboratory facilities. These guidelines provide information about the properties of commonly used nanoparticles/nanomaterials, their health and safety hazards and ways to protect oneself from potential laboratory exposures. Emergency procedures for dealing with accidental spills or nanoparticles exposure are also included. Nanoparticles can occur naturally in nature (e.g. volcanic eruptions, ocean spray, dust volatilization and etc. ), occur by accident (e.g. as side product from a reaction) or can be purposefully engineered. They are defined as material purposefully produced with at least one dimension in the 1 ­- 100 nanometer range (as stated by the American Society for Testing and Materials' (ASTM) Committee on Nanotechnology). These materials are investigated since they have unique properties compared to their bulk and atomic counterparts. These novel properties in engineered nanoparticles are widely used and consumer's products containing engineered nanomaterials are quickly rising. However, with these unique properties and characteristics (such as size), it is possible that these materials have an increased toxicity compared to their counterparts (the bulk and atomic scale) (Fig. 1). Often referred as nanometer-diameter particles that are not intentionally produced (less than 100 nm size), such as naturally airborne particles or incidental products of processes involving combustion (e.g. : carbon black, smoke, welding fumes). Intentionally manufactured material, containing particles (unbound state, aggregate or agglomerate) and where, for 50% or more of the particles in the number size distribution, one or more external dimensions is in the size range 1-100 nm. d) Nanopowder A mass of dry nanoparticles. A collection of nanoparticles suspended in a gas. f) Nanofibre A nano-object with two similar external dimensions in the nanoscale and the third dimension significantly larger (Fig. 2). 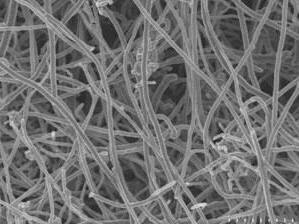 A nanofibre can be flexible or rigid. The two similar external dimensions are considered to differ in size by less than three times and the significantly larger external dimension is considered to differ from the other two by more than three times. The largest external dimension is not necessarily in the nanoscale. If the nanofibre has a length greater than 5 m, a width less than 3 m and a length to width ratio (aspect ratio) greater than 3:1, it is called a World Health Organization (WHO) nanofibre. A nanoparticle having a "platelet" morphology (a minute flattened body) that presents only one dimension in the nanoscale (meaning they have a very thin but wide aspect ratio) (Fig. 2). h) High Aspect Ratio Nanoparticles (HARNs) Particles with one or two dimensions in the nanoscale that are much smaller than the others. Nanofibres and nanoplatelets are considered as HARNs. A heterogeneous particle in which the various components are held together by relatively strong forces not easily broken apart (Fig. 3). These are nanoparticles that are commonly composed of carbon. Their shapes may be in the form of spheres, ellipsoids as well as tubes. The spheres are known as fullerenes and the tubes are known as carbon nanotubes (Fig. 4). These nanoparticles include metal oxides (e.g. TiO2, ZnO, CeO2), quantum dots (semiconductor devices with chemical composition of CdSe or ZnS) and zero-valence metals (e.g. zero-valence Fe, colloidal silver and gold). They consist of closely packed metals with particulate sizes of a few nanometers to a 100 nm in diameter. These particles also have size sensitive optical properties (Fig. 5). These nanoparticles are synthesized polymers with many side branches. Different functional groups are on the surface of these dendrimers and are used for different function for applications. In addition, they have cavities in the inside that can host other types of molecules (Fig. 6). These are nanoparticles combined with other nano or bulk materials. Some examples include using nanoparticles in a wide variety of merchandises to improve their current properties. 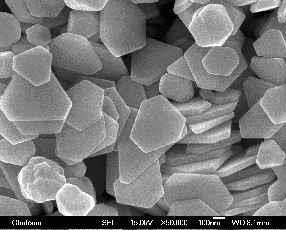 Nanoclays are another example in particular (including mineral silicates, montmorillonite, bentonite, kaolinite, hectorite and hallosite) (Fig. 7). Relative surface area and quantum effects are two important properties observed in nanoparticles compared to those in the bulk and atomic scale. These factors have the tendency to change/enhance reactivity, strength, optical and electrical properties of the nanoparticles compared to their bulk counterpart. 1) Relative Surface Area The decrease of material size increases the number of surface atoms (or molecules) compared to the rest of the material (meaning atoms [or molecules] inside of the material)[F22] (Fig. 8). For example, a nanoparticle with a size of 30 nm will have 5% of its atoms on the surface, 10 nm will have 20% of its atoms on the surface and a 3 nm particle will have 50% of its atoms on the surface. Therefore, smaller particles have a larger surface area per units of mass compared to their bulk material[F23] . This means that an increase of efficiency can be observed with the nanoparticle compared to their bulk counterpart when using the same mass. Due to the differential changes in size and quantum effect properties of nanoparticles, the information available is limited concerning their potential threat on human health or on the environment. However, this does not negate the responsibility of protecting oneself from nanoparticles. When working with unknown materials, precautions must be taken in order to establish possible threats by examining potential dangerous scenarios and preventing them from happening. This includes toxicity issues, chemical dangers, fires, explosions, dusts inhalation, electrostatic, size, shape and concentration. Some examples include: Change of property based on size - it has been observed that >80 nm size aluminum nanoparticle dust is very inert compared to its smaller size counterpart (< 80 nm), which is very reactive and explosive. Chemical toxicity ­ quantum dots are generally made with toxic ions [Cd2+ or Hg2+] and the quantum dots can dissociate into their ion state in the body or environment. There is currently no nanomaterial/nanoparticle-specific legislation in Quebec or Canada. In Quebec, the Part 1 of the Regulation Respecting Occupational Health and Safety provides permissible exposure limits for many chemicals of the same composition than nanoparticles. However, it does not take into consideration the particle size or the possibility of a different toxicity according to the granulometry of the specific chemical. Health Canada and Environment Canada are currently studying a possible distinct legislation concerning the manufacturing, import and export of nanomaterials, including their use and their environmental management. The only current obligation for manufacturers or importers is to provide restricted information to Environment Canada or Health Canada. Other countries (USA and EU) are now considering nanomaterials as new chemical substances. Since 2008, the EPA requires certain nanomaterials (fullerenes, quantum dots, carbon nanotubes) to go through its New Chemical Review process. However, no official occupational exposure limit values (OELs) specific to nanomaterials have been set in the USA or in the EU level. For certain nanomaterials, industry, research organisms and agencies have suggested either specific OELs (Table 3). Some companies and research institutes have also proposed an OEL for singlewall and/or multiwall carbon nanotubes (SWCNT & MWCNTs) (Bayer, Nanocyl and NIOSH). A threshold value for Carbon Nanotubes has also been set in Switzerland in 2011 by the Swiss National Accident Insurance Fund at 0.01 fibres/mL. 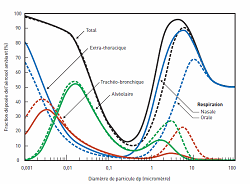 In any event, as a minimum, it is necessary to ensure compliance with any existing generic threshold limit values, such as general dust limit-values for alveolar and respirable dust fractions, irrespective of the sources contributing to these fractions. 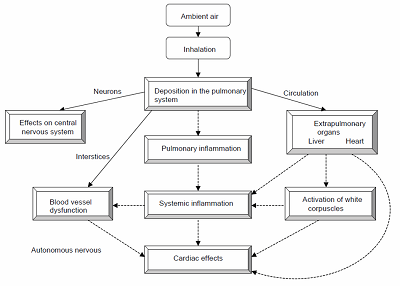 impacts on the respiratory system and the cardio-vascular system. Dermal exposure is also of importance. However, healthy skin has a better barrier function when compared to the respiratory tract although this barrier function could be limited by skin lesions, strong mechanical strain or small nanoparticles (<5 to 10 nm). Exposure by ingestion is of lower concern within the workplace; following good personal hygiene and basic safety practice rules (such as washing hands with soap and water before breaks and at the end of the workday, not wearing personal protective clothing outside of work areas and not taking them home for cleaning) should avoid any oral uptake. 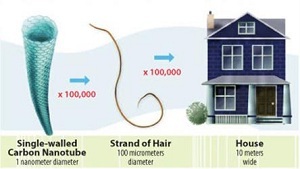 Due to the size effects, smaller particles may diffuse faster in air than their larger counterparts and can get further down the respiratory tract. In addition, it is hard to remove nanoparticles from the body as they are known to cross mucus membranes. Many potential health effects (Fig. 10) include: · inflammation of airway (bronchitis, asthma, emphysema); · lung cancer; · neurodegenerative diseases (Parkinson's and Alzheimer's disease); · cardiovascular effects and heart disease; liver cancer; Crohn's disease and colon cancer. Although, presently, it is still uncertain which parameters represent the best predictive value for toxicity, there is growing evidence that for nanomaterials a high aspect ratio (HARNs) and poor water solubility might lead to negative effects on human health. In order to overcome the lack of specific data about the bio persistence of nanoparticles, water solubility is often used as a proxy for bio persistence. In terms of solubility only, poorly soluble or insoluble nanoparticles are considered of concern; soluble nanoparticles (with a water solubility above 100 mg/L) are considered of no concern. However, in some cases, a material may show a poor solubility in water but a good solubility in biological media as, for example, cobalt which is insoluble in water but soluble in serum. 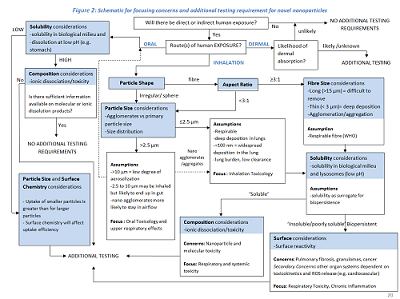 A categorization rating for the level of concern relating to the possible health hazard effects of nanoparticles based on the shape and persistence/water solubility characteristics is proposed in Table 4. Particular care is suggested when considering the risks that may be posed by nanoparticles possessing certain physical aspect characteristics. In particular, some HARNs demonstrated similarities in their physical characteristics to materials known to be hazardous, such as asbestos or some man-made mineral fibres. Studies suggested that HARNs may be retained in the pleural cavity for long periods of time if they show the additional characteristics: thinner than 3 m; longer than 10-20 m; bio persistent; do not dissolve/break into shorter fibres. As for nanofibres, concerns have been raised over nanoplatelets and their aerodynamic behaviour which might result in them penetrating deep within the lung. 2) Dermal Exposure The three layers of skin (epidermis, dermis and subcutaneous)[F30] make it difficult for ionic molecules to penetrate through. In addition, larger micro-particles cannot penetrate through the skin as well[F31] . However, nanoparticles can pass through the skin due to their smaller sizes (Fig. 13). They may pass through pores and go deep under the skin. Even if direct penetration of the skin has been reported for particles with a diameter of 1 m or less, most studies showed that nanoparticles can penetrate deeper skin layers only under unfavorable conditions (e.g. injured or stressed skin). Damaged skin (such as sun burns, eczema, acne and opened wounds) can accelerate the uptake of nanomaterials. 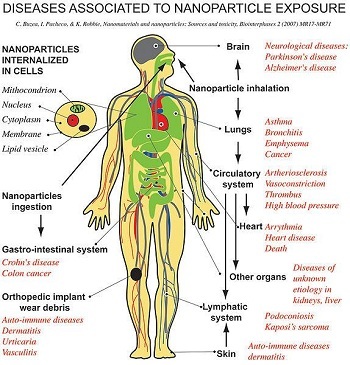 Nanoparticles can also be absorbed to the bloodstream and bioaccumulate into organs. They can be very toxic to tissues by increasing oxidative stress and inflammation of cytokine production resulting to cell death. Both carbon-containing and metal dusts can explode if they are aerosolized at a high enough concentration and if oxygen and an ignition source are present. Accidental explosions have been reported involving metal nanopowders that have resulted in deaths of workers. Because the surface-to-volume ratio increases as a particle becomes smaller, nanoparticles may be more prone to explosion than an equivalent mass concentration of larger particles. [F34] Dust explosions can occur where any powdered combustible material is present in an enclosed atmosphere or, in general, in high enough concentrations of dispersed combustible particles in atmosphere or other suitable gaseous medium such as molecular oxygen. Bench-scale research should present a low risk of explosion compared to work in pilot plants or full-scale manufacturing facilities. Nonetheless, researchers should avoid creating concentrated aerosols of combustible nanoparticles. Decreasing the particle size of combustible materials can increase combustion potential and combustion rate, leading to the possibility of relatively inert materials becoming highly reactive in the nanometer size range. Some nanoparticles are designed to generate heat through the progression of reactions at the nanoscale. Such materials may present a fire hazard that is unique to engineered nanoparticles. One example is aluminum powder; particles bigger than 80 nm are known to be inert when exposed to air / oxygen. On the opposite, particles less than 80 nm are known to be very reactive and can cause explosion. Another example is nanoscale Al/MoO3 particles that can ignite more than 300 times faster than corresponding micrometer-scale material. There are limited publications on the effects of engineered nanoparticles on animals and plants in the environment. To date only few quantitative analytical techniques for measuring nanoparticles in natural systems are available, which results in a serious lack of information about their occurrence in the environment. The main concern will be if any of the nanoparticles entering the environment are toxic or could become toxic to living species in the environment. For example, there is the possibility of nanoparticles being toxic to microorganisms in the soil and groundwater. Following on from this would be possible hazards from the nanoparticles or from consuming the microorganisms affected by the nanoparticles for fish, insects or mammals. There is also a risk to plants from nanoparticles which again could have a follow-on effect on the food chain. For example the deposition of atmospheric particles on crops could provide another route for toxic or reactive nanoparticles into the food chain [F36] (Fig. 14). Release of nanoparticles may come from point sources such as production facilities, landfills, or wastewater treatment plants or from nonpoint sources such as wear from materials containing NP[F37] . Accidental release during production or transport is also possible. In addition to the unintentional release there are also nanoparticles released intentionally into the environment. A number of studies have examined the uptake and effects of nanoparticles at a cellular level to evaluate their impact on humans; it can reasonably be assumed that the conclusions of these studies may be extrapolated to other species, but more research is needed to confirm this assumption. As a fact, a consistent body of evidence shows that nanosized particles are taken up by a wide variety of mammalian cell types and are able to cross the cell membrane and become internalized[F38] . Results from eco-toxicological studies show that certain nanoparticles have effects on organisms under environmental conditions, though mostly at elevated concentrations. However, persistent insoluble nanoparticles may cause problems in the environment that are much greater than those revealed by human health assessments. The risk of toxicity can be determined using this formula: = Exposure is defined as the chance of release for a specific material. Since engineered nanoparticles are relatively new, they are to be considered toxic and the potential of an exposure must be investigated to minimize the risk. Routine workplace activities and other foreseeable events (e.g. accidental spills or other equipment failure scenarios) which may potentially result in the release of nanoparticles and subsequent exposure of workers should be defined. A list of lab activities which can present a potential risk of exposure could consist of: material reception, unpacking, delivery or shipment; laboratory operations(e.g. weighing); cleaning and maintenance; storage and packaging; waste management; possible emergency situations (e.g. spill). As for any potentially hazardous materials, there are several methods to use in controlling a nanoparticles exposure. 1) Elimination or substitution This method consists of eliminating or substituting the toxic components being used. However, this method is not always feasible since the material of study may be toxic. This approach can be tackled by changing some aspects of process, such as: 2) using a liquid suspension instead of a free powder using of less toxic solvents Engineering controls--This method consists of using an exhaust or containment system to protect oneself from an exposure risk. Using this method strongly depends on the system that is being utilized (Fig. 16). When working with an exhaust system, a HEPA (High Efficiency Particulate Air filter; 99.97% efficiency for 300 nm particles) or ULPA filter (Ultra Low Penetration Air filter; 99.999% efficiency of 120 nm particles) must be used. Note that the general exhaust systems used at Concordia University do not have HEPA or ULPA filters. Examples of exhaust systems equipped with HEPA or ULPA filtering devices that can be used with nanoparticles (Fig. 17) are: Nano-safety cabinet (Labconco); Biological safety cabinet; Table-top HEPA filtration unit.--An alternative engineering control is to use a glove box or an enclosed system (Fig. 18). The primary advantage of using a glovebox is the protection it affords; when used properly to manipulate nanoparticle powders. The disadvantages of using a glovebox relate to the extra time required to move materials and equipment in and out of the enclosure, the difficulty of manipulating nanomaterials when wearing gloves, and the need to periodically clean the enclosure. The two most likely sources of exposure when using a glovebox are the transfer of materials into and out of the box and the cleaning of the box following its use. If a positive pressure using an inert atmosphere (e.g. nitrogen or argon) needs to be maintained in the enclosed system, one has to make sure that any exhaust getting out of the enclosure must be connected to a HEPA or ULPA unit in order to avoid any potential leak of nanoparticles. 3) Safe laboratory work practices Those practices include: awareness or safety training for students, staff, employees or anyone involved working with nanoparticles; development and application of standard operating procedures (SOPs) when working with specific nanoparticles; work area restriction for non-users or unauthorized personnel; no eating or drinking in the work laboratory; good sanitary practices, such as frequent hand washing; clear work-zone delimitation (e.g. signs or marking tape) within the laboratory area specific for nanoparticles/nanomaterial work: high-circulating areas, such as areas close to doors or hallways should be avoided. In addition, clean room mats or tacky mats can be used to reduce the spreading of nanoparticles. These mats help trap impurities for locations that require stringent dust and dirt control. The tacky surface removes particles from shoes avoiding therefore spreading of nanoparticles in nanoparticles-free areas. Other tolls such as anti-static devices can also be used when handling dry powders (Fig. 19) to avoid spreading of air born particles. 4) Personal Protective Equipment (PPE) Even though Personal protective equipment (PPE) should never be considered as the first line of defense against contaminants, nevertheless they must always be used in order to minimise users' exposure to nanoparticles. Basic nanoparticles PPE should include: Hand protection Gloves must always be worn when handling dry nanoparticles or nanoparticles suspension in various solvents. Even though studies have demonstrated that most types of gloves (latex, nitrile, vinyl, etc.) offer a good barrier against most nanoparticles in the powder form, nitrile gloves proved to offer an increased protection when suspension in solvents are used. Double gloving is highly recommended for extensive use and gloves with gauntlets (extended sleeves) reduce risks of skin exposure and therefore offer a better protection (Fig. 20). Disposable gloves should be changed routinely or at the first sign of contamination. Eye protection Safety glasses are mandatory in all Concordia University laboratories and should therefore be the minimal eye protection to be worn when appropriate engineering controls (e.g. nano-cabinet or glove box) is being used. However, safety goggles offer an increased eye protection compared to safety glasses and should be favored when: appropriate engineering controls are deficient or not available; o a heavy use or large amounts of nanoparticles are being used; a suspension of nanoparticles in solvents is being generated and splash or aerosol generation is possible. Protective clothing It was demonstrated the nanoparticles could get through most of regular woven fabrics (e.g. cotton). [F39] Therefore, regular lab coats do not offer an appropriate protection from nanoparticles. Impervious disposable clothing, such as Tyvek® lab coats, sleeves and shoe covers should rather be used (Fig. 21). Their fabrics are shown to be impermeable to nanoparticles. If a head scarf is worn by the lab user, a Tyvek® hood should be worn on top of it to avoid possible contamination of the cloth. Protecting clothing should be stored and donned in a dedicated "buffer" area in lab area in order to avoid cross-contamination. Protection clothing should not be worn outside lab and non-disposable work clothes should not be taken home for cleaning; re-usable protective clothing should rather be laundered through department laundering services. Disposable protecting clothing (gloves and Tyvek® gear) should be disposed of as chemical waste. · Respiratory protection Respiratory protection should be worn when working with dry nano-powders and when appropriate engineering controls (e.g. nano-safety cabinet) are deficient or not available. Here are descriptions of different types of respirators or masks available on the market along with their intended use; it has to be noted that these respirators cannot be used in areas of low oxygen concentration (i.e. an oxygen deficient atmosphere). Surgical masks Those are loose-fitting and disposable masks preventing the release of contaminants from the user to the environment. They are not meant to protect against dust or nanoparticles and should therefore not be used in laboratories using nanoparticles. o Filtering Face-piece Respirators (FFRs) Those are the most commonly used disposable respiratory masks and they protect user from dusts and aerosols according to their NIOSH certification: N : not resistant to oil particles R : somewhat resistant to oil particles (8 hours of continuous or intermittent use) P : strongly resistant to oil particles(oil proof) 95, 99 or 100 : protection rating (%) in NIOSH test FFRs do not act as sieves but rather intercept nanoparticles using different types of filtering mechanisms; impaction, interception, diffusion and electrostatic attraction (when electret filter media is used). Once the particles are trapped within the FFRs filter media, they cannot be removed (not a reversible process). Several tests performed by different institutes (e.g. NIOSH, OSHA, IRSST...) demonstrated that typical N95 masks met the NIOSH filtering standards (< 5% penetration for particles less than 100 nm) offering therefore an adequate protection against nanoparticles. However, their efficacy was greatly affected by humidity and breathing rate. The main safety issue observed with the disposable FFRs resides in achieving proper seal around nose and mouth. Improper use or bad work practices by workers (e.g. putting de FFRs on top of the head) often results in a lose fit which allow nanoparticles to enter the mask (Fig. 22). Therefore, their use for work with nanoparticles is not recommended by EHS. o Half or full-face respirators Half or full-face respirators consist of a rubber (i.e. silicone) mask, worn over the nose and mouth and held in place by adjustable straps which go over and behind the user's head (Fig. 23). The respirators are fitted with two removable filter cartridges. These units are heavier than the disposable FFRs, but provide far better protection for the wearer, provided that they are fitted properly. Anyone requiring to wear a half or fullface respirator must previously get fit-tested by EHS. This can be done contacting EHS at ehs@concordia.ca. Nanoparticles, nanomaterials and nanopowders must be stored in closed and sealed containers at all times, in a cool and well-ventilated area clearly identified (e.g. `Nanomaterials storage area ­ `POTENTIALLY TOXIC'). If possible, a lab cabinet restricted to nanomaterials storage only should be dedicated. All containers with nanoparticles in should be clearly identified (e.g. Nanoscale Gold Nanoparticles). If the nanoparticles are received in plastic (Ziploc) bags from the supplier, the bag should be placed in a secondary hard sealable container. Nanoparticles and nanopowders should be stored away from acids, oxidizers and other metals. There are currently no specific regulation or guidelines for proper disposal of nanoparticles. It is therefore important to handle nanoparticles very cautiously since they are to be considered as toxic. Any waste containing nanoparticles or nanomaterials should never be disposed of in regular garbage and flushed down the drain. Nanoparticles should be disposed of following EHS chemical waste guidelines: any contaminated objects (paper, wipes, tips) should be disposed of as solid chemical waste; any contaminated disposable PPE (e.g. gloves, disposable lab coats) should be disposed of as solid chemical waste; pure nanomaterials/nanoparticles in the solid (including powder) form should also be disposed of as chemical waste; nanoparticles in solution can be disposed of as liquid chemical waste. All waste containers should be properly labelled, mentioning that they contain nanoparticles and should be properly sealed once full and ready to be picked up. For any concerns about nanomaterials waste, please contact EHS at hazardouswaste@concordia.ca. The potential for inhalation exposure during cleanup will be influenced by the likelihood of nanoparticles becoming airborne, with powder form presenting a greater inhalation potential than the solution forms. Small nanoparticle spills that occur on non-porous surfaces (e.g. linoleum, stainless steel, hardwood flooring) can be cleaned by trained lab personnel. However, if the spill occurs on a porous surface or item (e.g. rug or mat), it might become difficult to fully decontaminate this surface and therefore the item should be discarded along with other nanomaterial waste. 1) In the event of a small spill If lab users are within their comfort zone or have been trained for spill response, they can clean up the spill using the following techniques: Any solid nanoparticles should be cleaned up using wet wiping.-Dry sweeping or air hoses should not be used to clean work areas. If dry vacuuming is to be used, only a vacuum cleaner equipped with a HEPA is to be used. Absorbent wipes for liquid suspensions. NIOSH recommends the following equipment included in a nanomaterial spill kit to be readily available in or near each laboratory working with such materials. A nanomaterial spill kit for a laboratory environment may contain the following: Barricade tape Nitrile gloves Elastomeric respirator with appropriate filters Adsorbent material Wipes Sealable plastic bags Walk-off mat (e.g., Tacki-Mat®) Spray bottle with deionized water or other appropriate liquid Procedure: 1. Clean-up the spill immediately after it has occurred. 2. Prevent the spread of the spilled nanomaterials. DO NOT allow people to walk through spill area. 3. Wear PPE (like disposable gloves and shoe covers or place double plastic bags over your shoes) during the clean up. 4. Place the collected nanoparticles into a clearly labelled and sealed chemical waste container. 5. Contact EHS (hazardouswaste@concordia.ca) for waste pick-up. 2) In the event of a large spill Large spills or spills of highly toxic or dangerously reactive materials should not be handled by lab users. In the event of any large spills, lab users should readily contact Security at extension 3717. Procedure: 1. Advise and warn co-worker 2. Help contaminated or injured persons. 3. Evacuate the spill area and do not touch the hazardous material 4. Keep others from entering contaminated area. 5. Notify Security at extension 3717 or 514-848-3717 and provide them with the following information: Location of spill; Name of hazardous material; Quantity involved; Related health hazards and precautions to be taken. 6. Provide Material Safety Data Sheet or Safety Data Sheet (MSDS/SDS) or appropriate documentation. Lab users need to remain available to the Emergency Response Team or Security in order to provide assistance. An Injury/near-miss report must be filled up in the event of any types of spill. Injury/near miss reports can be found on the EHS website in the injury report section. Nanoparticles and nanomaterials toxicity are often found to be chemical-specific. The effects of exposure to nanoparticles may therefore vary depending on the type of materials being used (e.g. nanoclays, carbon nanotubes or metals). One must therefore always refer to the MSDS/SDS of the chemical being used. Here are some general guidelines in the event of exposure. 1. 2. 3. 4. 5. Remove any contaminated clothing immediately. Wash affected area with soap or mild detergent and large amounts of water until no evidence of the nanomaterial remains (15-20min). Refer to MSDS/SDS of material. Contact Security ext. 3717 to get medical attention. Any contaminated clothing should be washed before reuse. 1. 2. 3. Immediately rinse eyes and inner surface of eyelid with water for 15 minutes by forcibly holding the eye open. Refer to MSDS/SDS of material. Contact Security ext. 3717 to get medical attention. 1. 2. 3. 4. 5. Remove from exposure and move affected person to fresh air immediately. Refer to MSDS/SDS of material. Contact Security ext. 3717 to get medical attention. If breathing is difficult, give oxygen. If breathing has ceased, apply artificial respiration using oxygen and a suitable mechanical device such as a bag and a mask; never give direct mouth-to-mouth resuscitation to avoid any potential contamination. 1. 2. 3. Rinse inside of mouth with water. Do not induce vomiting. Refer to MSDS/SDS of material. Never give anything by mouth to an unconscious person. Contact Security ext. 3717 to get medical attention. Quantum dots are tiny particles or nanocrystals of a semiconducting material with diameters in the range of 2-10 nanometers (10-50 atoms). They were first discovered in 1980.1 Quantum dots display unique electronic properties, intermediate between those of bulk semiconductors and discrete molecules, that are partly the result of the unusually high surface-to-volume ratios for these particles.2-4 The most apparent result of this is fluorescence, wherein the nanocrystals can produce distinctive colors determined by the size of the particles. Quantum dots can be classified into different types based on their composition and structure. Figure 1. 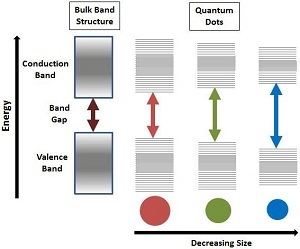 Splitting of energy levels in quantum dots due to the quantum confinement effect, semiconductor band gap increases with decrease in size of the nanocrystal. Quantum dots can be single component materials with uniform internal compositions, such as chalcogenides (selenides or sulfides) of metals like cadmium or zinc, example, CdSe (Aldrich Prod. No. 662550) or CdS (Aldrich Prod. No. 662593). The photo- and electroluminescence properties of core-type nanocrystals can be fine-tuned by simply changing the crystallite size. Figure 2. Photoluminescence of alloyed CdSxSe1-x/ZnS quantum dots of 6nm diameter. The material emits different color of light by tuning the composition. Aldrich Materials Science offers semiconductor, core-shell and alloyed quantum dots tuned to emit different colors in the visible spectrum while exhibiting high quantum yield. Nanocrystals are available in both aqueous and organic formulations suitable for use in different applications. Find the complete list of Quantum Dots offered by Aldrich Materials Science here. 1. Ekimov, A. I.; Onushchenko, A. A. JETP Lett. 1981, 34, 345–349. 2. Kastner, M. A. Physics Today, 1993, 46(1), 24. 3. Ashoori, R. C. Nature, 1996, 379(6564), 413. 4. Collier, C. P.; Vossmeyer, T.; Heath, J. R. Annual Review of Physical Chemistry, 1998, 49, 371. 5. Reimann, S. M.; Manninen, M. Reviews of Modern Physics, 2002, 74(4), 1283. 6. Bawendi, M. C.; Steigerwald, M. L.; Brus, L. E. Annual Review of Physical Chemistry, 1990, 41, 477. 7. Yoffe, A. D. Advances in Physics, 2001, 50(1), 1. 8. Bailey, R. E.; Nie, S. Edited by Rao, C. N. R.; Mueller, A.; Cheetham, A. K. Chemistry of Nanomaterials, 2004, 2, 405. 9. Dorfs, D.; Eychmueller, A. Zeitschrift fuer Physikalische Chemie, 2006, 220(12), 1539. 10. Smith, A. M.; Nie, S. Nature Biotechnology, 2009, 27(8), 732. 11. Vastola, G.; Zhang, Y.-W.; Shenoy, V. B. Current Opinion in Solid State & Materials Science, 2012, 16(2), 64. 12. Vahala, K. J. Nature, 2003, 424(6950), 839. 13. Nirmal, M.; Brus, L. Accounts of Chemical Research, 1999, 32(5), 407. 14. Sargent, E. H. Nature Photonics, 2012, 6(3), 133. 15. Zhao, Y.; Burda, C. Energy & Environmental Science, 2012, 5(2), 5564. 16. Medintz, I. L.; Uyeda, H. T.; Goldman, E. R.; Mattoussi, H. Nature Materials, 2005, 4(6), 435. [F2]Dendrimers are highly branched, star-shaped macromolecules with nanometer-scale dimensions. Dendrimers are defined by three components: a central core, an interior dendritic structure (the branches), and an exterior surface with functional surface groups. The varied combination of these components yields products of different shapes and sizes with shielded interior cores that are ideal candidates for applications in both biological and materials sciences. While the attached surface groups affect the solubility and chelation ability, the varied cores impart unique properties to the cavity size, absorption capacity, and capture-release characteristics. Applications highlighted in recent literature include drug delivery, gene transfection, catalysis, energy harvesting, photo activity, molecular weight and size determination, rheology modification, and nanoscale science and technology.1, 2 Monodisperse dendrimers are synthesized by step-wise chemical methods to give distinct generations (G0, G1, G2, ...) of molecules with narrow molecular weight distribution, uniform size and shape, and multiple (multivalent) surface groups Z. Dendrons are monodisperse wedge-shaped sections of dedrimers with a single focal point reactive function. Hyperbranched polymers are polydisperse dendritic macromolecules synthesized by lower-cost polymerization methods. (1) Functional Polymers and Dendrimers: From Synthesis to Application. [F3]They are molecules composed entirely of carbon, in the form of a hollow sphere, ellipsoid, or tube. Spherical fullerenes are sometimes called buckyballs, the C60 variant is often compared to a typical white and black soccer football. Cylindrical fullerenes are called buckytubes. Recently discovered is the "buckyegg", by researchers at UC Davis. Fullerenes are similar in structure to graphite, which is composed of a sheet of linked hexagonal rings, but they contain pentagonal (or sometimes heptagonal) rings that prevent the sheet from being planar. [F9]Granular material such as sand, gravel, crushed gravel, crushed stone, slag, and cinders. Aggregate is used in construction for the manufacturingof concrete, mortar, grout, asphaltic concrete, and roofing shingles. It is also used in leaching fields, drainage systems, roof ballast, landscaping, and as a base course for pavement and grade slabs. Aggregate is classified by size and gradation. [F14]Buckminsterfullerene (or bucky-ball) is a spherical fullerene molecule with the formula C60. It has a cage-like fused-ring structure (truncated icosahedron) which resembles a football (soccer ball), made of twenty hexagons and twelve pentagons, with a carbon atom at each vertex of each polygon and a bond along each polygon edge. It was first generated in 1985 by Harold Kroto, James R. Heath, Sean O'Brien, Robert Curl, and Richard Smalley at Rice University. Kroto, Curl and Smalley were awarded the 1996 Nobel Prize in Chemistry for their roles in the discovery of buckminsterfullerene and the related class of molecules, the fullerenes. The name is a reference to Buckminster Fuller, as C60 resembles his trademark geodesic domes. Buckminsterfullerene is the most common naturally occurring fullerene molecule, as it can be found in small quantities in soot. Solid and gaseous forms of the molecule have been detected in deep space. Buckminsterfullerene is one of the largest objects to have been shown to exhibit wave–particle duality; as stated in the theory every object exhibits this behavior. Its discovery led to the exploration of a new field of chemistry, involving the study of fullerenes. [F16]They are molecules composed entirely of carbon, in the form of a hollow sphere, ellipsoid, or tube. [F17]Quantum dots are tiny particles or nanocrystals of a semiconducting material with diameters in the range of 2-10 nanometers (10-50 atoms). They were first discovered in 1980.1 Quantum dots display unique electronic properties, intermediate between those of bulk semiconductors and discrete molecules, that are partly the result of the unusually high surface-to-volume ratios for these particles.2-4 The most apparent result of this is fluorescence, wherein the nanocrystals can produce distinctive colors determined by the size of the particles. 17. Ekimov, A. I.; Onushchenko, A. A. JETP Lett. 1981, 34, 345–349. 18. Kastner, M. A. Physics Today, 1993, 46(1), 24. 19. Ashoori, R. C. Nature, 1996, 379(6564), 413. 20. Collier, C. P.; Vossmeyer, T.; Heath, J. R. Annual Review of Physical Chemistry, 1998, 49, 371. 21. Reimann, S. M.; Manninen, M. Reviews of Modern Physics, 2002, 74(4), 1283. 22. Bawendi, M. C.; Steigerwald, M. L.; Brus, L. E. Annual Review of Physical Chemistry, 1990, 41, 477. 23. Yoffe, A. D. Advances in Physics, 2001, 50(1), 1. 24. Bailey, R. E.; Nie, S. Edited by Rao, C. N. R.; Mueller, A.; Cheetham, A. K. Chemistry of Nanomaterials, 2004, 2, 405. 25. Dorfs, D.; Eychmueller, A. Zeitschrift fuer Physikalische Chemie, 2006, 220(12), 1539. 26. Smith, A. M.; Nie, S. Nature Biotechnology, 2009, 27(8), 732. 27. Vastola, G.; Zhang, Y.-W.; Shenoy, V. B. Current Opinion in Solid State & Materials Science, 2012, 16(2), 64. 28. Vahala, K. J. Nature, 2003, 424(6950), 839. 29. Nirmal, M.; Brus, L. Accounts of Chemical Research, 1999, 32(5), 407. 30. Sargent, E. H. Nature Photonics, 2012, 6(3), 133. 31. Zhao, Y.; Burda, C. Energy & Environmental Science, 2012, 5(2), 5564. 32. Medintz, I. L.; Uyeda, H. T.; Goldman, E. R.; Mattoussi, H. Nature Materials, 2005, 4(6), 435. Type I Photoinitiators: Unimolecular Photoinitiators. These substances undergo an homolytic bond cleavage upon absorption of light. Benzoin and its derivatives are the most widely used photoinitiators for radical polymerization of vinyl monomers. Upon photolysis, these thermally and hygroscopically stable initiators undergo irreversible photofragmentation to produce cation radicals and Brønsted acids. Reactive species thus produced photochemically with onium salts initiate the cationic polymerization of suitable monomers as illustrated below. For practical applications, onium salts should absorb light appreciably at wavelengths longer than 350 nm where the commercially available medium and high-pressure mercury lamps emit much of their radiation. The indirect actions of these systems, which extend their spectral sensitivity to longer wavelengths, are shown below.. Many aromatic hydrocarbons such as anthracene, phenothiazine, and perylene are able to sensitize the decomposition of onium salts via electron transfer. The irradiation of the sensitizer is followed by the formation of a complex between excited sensitizer molecules and ground state onium salt. In this complex, one electron is transferred from the sensitizer to the onium salt giving rise to the generation of sensitizer radical cation as a result of homolytic cleavage of the corresponding onium salt. The radical cations themselves initiate the polymerization of appropriate monomers or, alternatively, interact with hydrogen donor constituents of the polymerization mixture (such as solvent or monomer) resulting in the release of Brønsted acid. Pyridinium salts are capable of forming charge transfer (CT) complexes with electron rich donors such as methyl- and methoxy-substituted benzene. It was found that the CT complexes formed between pyridinium salts and aromatic electron donors act as photoinitiators for the cationic polymerization of cyclohexene oxide and 4-vinyl cyclohexene oxide. The mechanism illustrated in equations 19 and 20 for the initiation of the cationic polymerization has been suggested. Among the indirectly acting initiating systems, free radical promoted cationic polymerization is the most flexible route, since free radical photoinitiators with a wide range of absorption characteristics are available. Many photochemically formed radicals can be oxidized by onium salts. The cations thus generated are used as initiating species for cationic polymerization according to the following reactions. [F20]They are molecules composed entirely of carbon, in the form of a hollow sphere, ellipsoid, or tube. [F21]Dendrimers are highly branched, star-shaped macromolecules with nanometer-scale dimensions. Dendrimers are defined by three components: a central core, an interior dendritic structure (the branches), and an exterior surface with functional surface groups. The varied combination of these components yields products of different shapes and sizes with shielded interior cores that are ideal candidates for applications in both biological and materials sciences. While the attached surface groups affect the solubility and chelation ability, the varied cores impart unique properties to the cavity size, absorption capacity, and capture-release characteristics. 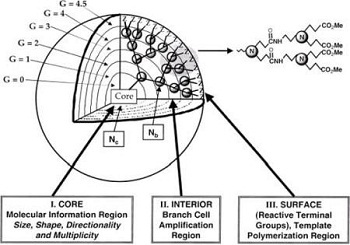 Applications highlighted in recent literature include drug delivery, gene transfection, catalysis, energy harvesting, photo activity, molecular weight and size determination, rheology modification, and nanoscale science and technology.1, 2 Monodisperse dendrimers are synthesized by step-wise chemical methods to give distinct generations (G0, G1, G2, ...) of molecules with narrow molecular weight distribution, uniform size and shape, and multiple (multivalent) surface groups Z. Dendrons are monodisperse wedge-shaped sections of dedrimers with a single focal point reactive function. 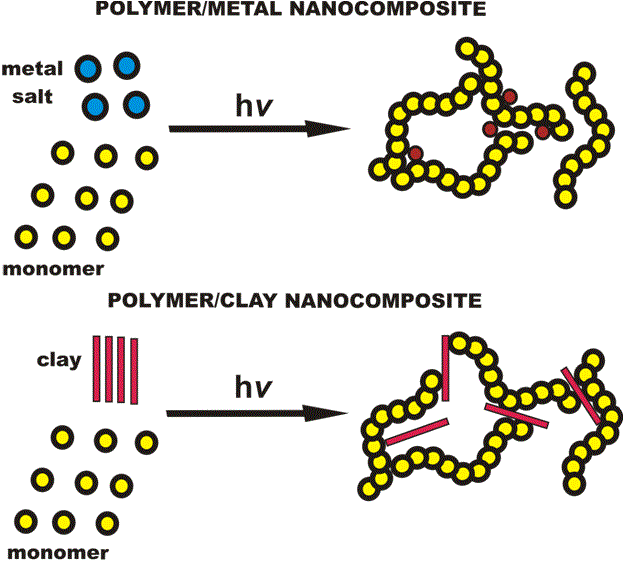 Hyperbranched polymers are polydisperse dendritic macromolecules synthesized by lower-cost polymerization methods.